The Teacher Dad: You like Ice Cream? Me Too!.. Now What? I've learned a lot about teaching over that time, and I think the main thing was emphasized with my beginning of the year activity. I've done something like this activity before, but this year, I was able to help tie together the main point. Instead of doing one of those normal "ice breakers," I broke my students into groups of 3 or 4 to compile a few lists. I handed out a piece of paper to each group and the person that started with the paper wrote down the first topic. Then passed the paper to the next person to write down an idea, who passed it to the next, and so on. Not a bad list, huh? 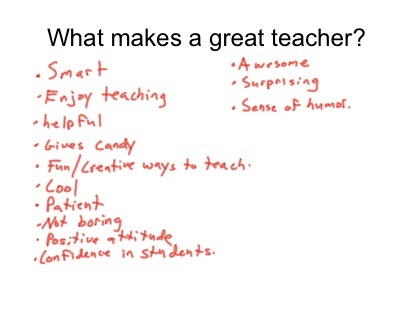 When they were asked, they could spell out exactly what they thought makes a great teacher. When I pressed further, I was surprised at how many of them could mention more than one teacher from their past that they felt was a "bad" teacher, and gave crystal clear examples to support the claims! It's always eye opening to hear their perspective on classroom situations! After we had put all of their ideas up on the board, I stepped back and congratulated them. I told them how proud I was that they already knew what it takes to be a great student. I then promised them that I'll do all that they asked of me in the "great" teacher lists they created. I would do all of that, and all they had to do was everything on their list! It is at this point that the main point came into view: They can't be successful without me being great, and vice versa! They can expect me to be all of the things they want out of a great teacher if they can live up to the qualities on their list. I promised to hold them accountable if they hold me accountable. I am the best math teacher they will have this year, and they are the best students I will have this year. And if we work together, it will be the best school year they have ever had. I loved creating this moment for them to see that I'm here to work with them, not against them. I'm a teacher that they can trust will be what they are asking me to be. I've created a relationship with them within the first few days of school that goes beyond the simple "I like Mint Chocolate Chip Ice Cream TOO" type of Ice Breaker. We now have a contract that is printed and up on the wall, so that if I'm slacking or if they are, we can point to our list, smile, and fix things to make it a great year! I can't wait! What a lucky crew of 7th graders to have discovered that Mr. Mach is on their schedule! Even better than discovering that your locker is next to that cute girl/guy, and you were able to help them figure out how to work the combo on the first day!